Board Meeting Archives, Budget/Financing, Community Partners, Curriculum, Elections, Events, Fund Raising, Governance/Board Decision Making, History - Madison Schools, School Climate, Staff Support, Student Support, Teacher Support, What Can I Do? On Monday evening, March 28, 2011 at 6pm, the Madison Metropolitan School District’s (MMSD) Board of Education will meet to vote on whether or not to support the Urban League’s submission of a $225,000 charter school planning grant to the Wisconsin Department of Public Instruction. This grant is essential to the development of Madison Preparatory Academy for Young Men, an all-male 6th – 12th grade public charter school. Given the promise of our proposal, the magnitude of longstanding achievement gaps in MMSD, and the need for adequate time to prepare our final proposal for Madison Prep, we have requested full support from the school board. Monday’s Board meeting will take place at the Doyle Administration Building (545 West Dayton Street) next to the Kohl Center. We hope you will come out to support Madison Prep as this will be a critical vote to keep the Madison Prep proposal moving forward. Please let us know if you’ll be attending by clicking here. If you wish to speak, please arrive at 5:45pm to register. Prior to you attending, we want to clarify misconceptions about the costs of Madison Prep. Recent headlines in the Wisconsin State Journal (WSJ) reported that Madison Prep is “less likely” to be approved because of the size of the school’s projected budget. The article implied that Madison Prep will somehow cost the district more than it currently spends to educate children. This, in fact, is not accurate. We are requesting $14,476 per student for Madison Prep’s first year of operation, 2012-2013, which is less than the $14,802 per pupil that MMSD informed us it spends now. During its fifth year of operation, Madison Prep’s requested payment from MMSD drops to $13,395, which is $1,500 less per student than what the district says it spends now. Madison Prep will likely be even more of a savings to the school district by the fifth year of operation given that the district’s spending increases every year. A March 14, 2011 memo prepared by MMSD Superintendent Daniel Nerad and submitted to the Board reflects the Urban League’s funding requests noted above. This memo also shows that the administration would transfer just $5,541 per student – $664,925 in total for all 120 students – to Madison Prep in 2012-2013, despite the fact that the district is currently spending $14,802 per pupil. Even though it will not be educating the 120 young men Madison Prep will serve, MMSD is proposing that it needs to keep $8,935 per Madison Prep student. Therefore, the Urban League stands by its request for equitable and fair funding of $14,476 per student, which is less than the $14,802 MMSD’s administration have told us they spend on each student now. As Madison Prep achieves economies of scale, reaches its full enrollment of 420 sixth through twelfth graders, and graduates its first class of seniors in 2017-18, it will cost MMSD much less than what it spends now. 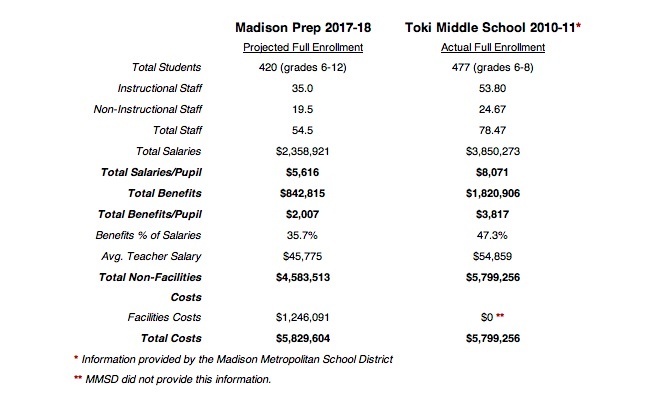 A cost comparison between Madison Prep, which will enroll both middle and high school students at full enrollment, and MMSD’s Toki Middle School illustrates this point. We have also attached four one-page documents that we prepared for the Board of Education. These documents summarize key points on several issues about which they have expressed questions. Madison Preparatory Academy Brochure (PDF): English & Spanish. DPI Planning Grant Application: Key Points and Modifications. In order to maintain Madison Prep, the school district would have to find these amounts somewhere in our budget or else raise property taxes to cover the expenditures. I am not willing to take money away from our other schools in order to fund Madison Prep. I have been willing to consider raising property taxes to come up with the requested amounts, if that seemed to be the will of the community. However, the draconian spending limits the governor seeks to impose on school districts through the budget bill may render that approach impossible. Even if we wanted to, we likely would be barred from increasing property taxes in order to raise an amount equal to the net cost to the school district of the Madison Prep proposal. This certainly wouldn’t be the first time that budgetary considerations prevent us from investing in promising approaches to increasing student achievement. For example, one component of the Madison Prep proposal is a longer school year. I’m in favor. One way the school district has pursued this concept has been by looking at our summer school model and considering improvements. A good, promising plan has been developed. Sadly, we likely will not be in a position to implement its recommendations because they cost money we don’t have and can’t raise under the Governor’s budget proposal. Similarly, Madison Prep proposes matching students with mentors from the community who will help the students dream bigger dreams. Effective use of mentors is also a key component of the AVID program, which is now in all our high schools. We would very much like to expand the program to our middle schools, but again we do not have the funds to do so. Mr. Hughes largely references redistributed state tax dollars for charter/virtual schools – a portion of total District per student spending – the total (including property taxes) that Madison Prep’s request mentions. I find Madison Prep’s fully loaded school based cost comparisons useful. Ideally, all public schools would publish their individual budgets along with total District spending.